The quarterly meeting of the Nodaway County SB40 Board was January 15. Questions have risen recently about the distribution of the tax levy funds by the board. Senate Bill 40 was enacted in 1969 to allow the citizens of Missouri counties to vote on a tax levy to support various local services for individuals with developmental disabilities. Historically, Nodaway County passed a tax levy on March 25, 1975, to establish a sheltered workshop and residence facility for handicapped persons as provided for in Missouri law, Sections 205.968 to 205.972 RSMo Revised Statutes 1969 and as amended by Senate Bill #40. The board invited Nodaway County Prosecuting Attorney Robert Rice to the October 2018 meeting. After research, he sent back a letter dated December 21, 2018. “Section 205.968 RSMo empowers the creation of a board to establish and/or operate a sheltered workshop, residence facilities or related services, for the care or employment or both of persons with a disability. Service may only be provided for those persons defined as persons with a disability in Section 178.900 RSMo and 205.968 RSMO. b. A developmental disability as defined in section 630.005. “2. ‘Person with a disability’ shall mean a person who is lower-range educable or upper-range trainable intellectually disabled or a person who has a developmental disability. “Missouri case law decisions have interpreted the statutes above to mean a SB40 Board may expend funds to sheltered workshops, residence facilities, or related services. “See Vocational Services, Inc. v. The Development Disabilities Resource Board, 5 S.W.3d 625, Mo.App.W.D.1999. See also Joplin Workshops, Inc. v. Jasper County Sheltered Facilities, 308 S.W.3d 252, Mo.App.S.D. 2010. In Vocational Services and Joplin Workshops the particular sheltered workshops sued their respective SB40 Board over the appropriation decisions. Upon receipt of the letter, the board approached attorney David Baird, Maryville, who suggested the board approach the Missouri State Attorney General’s office for clarification. 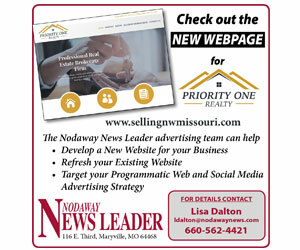 The money is currently distributed in an 80/20 split, with 80 percent going to NOCOMO Industries, the Nodaway County sheltered workshop, and 20 percent being distributed as the board sees fit. This 20 percent distribution is what has raised questions recently. The board decided to hold off on sending a letter to State Representative Allen Andrews and approaching the attorney general until the April meeting. Board member Margaret Nelson stated she was nervous if the board ignored the case law presented by Rice because it doesn’t fit how the board wants to use the money. Board Treasurer Jeannette Schieber said she looked at SB40 Board as being separate from the Nodaway County governmental procedures. The Nodaway County Commissioners appoint the board and the tax levy is based on both real and personal property located in Nodaway County. • $9,365 for patient care; because of HIPAA (Health Insurance Portability and Accountability Act) rules, the board does not release the names of the people receiving the funding or what is covered. • $4,500 for emergency fund; again, names are not released – $3,500 was listed as KC trips, $900 for Tennessee trips and $100 for dental work. Board Secretary Jill Blackford released the October 9, 2018, open and closed session minutes after board approval at the January meeting. The only topic listed in October’s closed session was the awarding of $100 for dental work to an individual.